Lon L Fuller's account of what he termed 'the internal morality of law' is widely accepted as the classic twentieth century statement of the principles of the rule of law. Much less accepted is his claim that a necessary connection between law and morality manifests in these principles, with the result that his jurisprudence largely continues to occupy a marginal place in the field of legal philosophy. 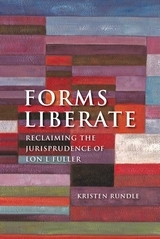 In 'Forms Liberate: Reclaiming the Jurisprudence of Lon L Fuller', Kristen Rundle offers a close textual analysis of Fuller's published writings and working papers to explain how his claims about the internal morality of law belong to a wider exploration of the ways in which the distinctive form of law introduces meaningful limits to lawgiving power through its connection to human agency. By reading Fuller on his own terms, 'Forms Liberate' demonstrates why his challenge to a purely instrumental conception of law remains salient for twenty-first century legal scholarship. II What is Being 'Reclaimed'? Fuller and Shapiro: A New Conversation? “Rundle has written a beautiful book about the 'jurisprudence' of Fuller. This was to be expected for those who were already familiar with her work. Kristen Rundle is a Lecturer in Law at the London School of Economics.